What Are Arteries, Veins And Capillaries? As human beings, we have always held our bodies in wonder and amazement. Our body is one smooth, complex piece of machinery carrying out hundreds and thousands of tasks at any given second. The heart pumps blood, the tissues and organs receive nutrients and supplies, and waste matter is deposited into the blood, filtered by the liver and excreted safely! Even though so much is happening, we seemingly remain oblivious to it all! It’s not as though we are exhausted every second of the day, despite our bodies working so hard! Our body consists of approximately 75 trillion cells, each of which is provided for by our incredible circulatory system. It brings all the material that the cell needs to live and grow and removes everything it doesn’t need or want, such as waste products and carbon dioxide. The word circulatory is derived from the Latin word circulatus, which means to form a circle. Thus, our circulation takes place in two circular paths or routes. The first route is the pulmonary circulation route, wherein the heart pumps deoxygenated blood to the lungs, while systemic circulation (second route) is where oxygenated blood is pumped from the heart to the rest of the body. We know that the heart is the main pump of the body, and pumps the transport medium–blood—throughout our system. Now, this blood doesn’t just flow through the body in an unregulated manner. There is deoxygenated blood, oxygenated blood, blood going to certain cells in the toe and other blood going to cells in the brain, along with anywhere and everywhere else it’s needed. Blood flow is not a random act of nature; there is a method to this madness—a well-regulated vascular system in the body consisting of a huge number of blood vessels that carry this blood everywhere. 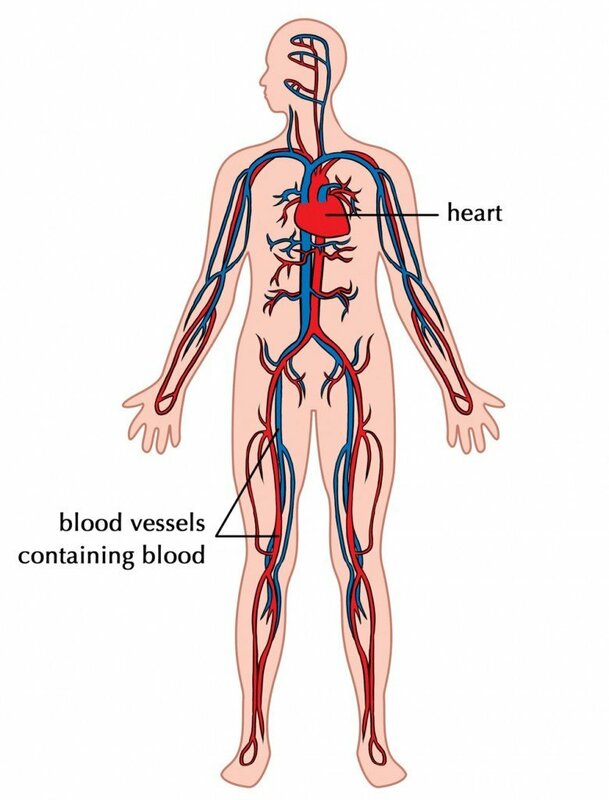 Our circulatory system is like a circuit of blood vessels running through our bodies. There is an extensive network of arteries, capillaries, and veins that help maintain homeostasis and provide all the nutrients we need, where we need them. Since all these vessels carry out the function of transport, it makes sense that they would have some structural similarities, but with certain variations, so they can carry out their own designated functions. In general, all blood vessels consist of three distinct regions and a lumen—a hollow passage in the center through which blood passes. Each of these regions is called a “tunic”, which essentially means a covering or lining. All tunics of the blood vessels contain smooth muscles and elastin but in varying quantities. 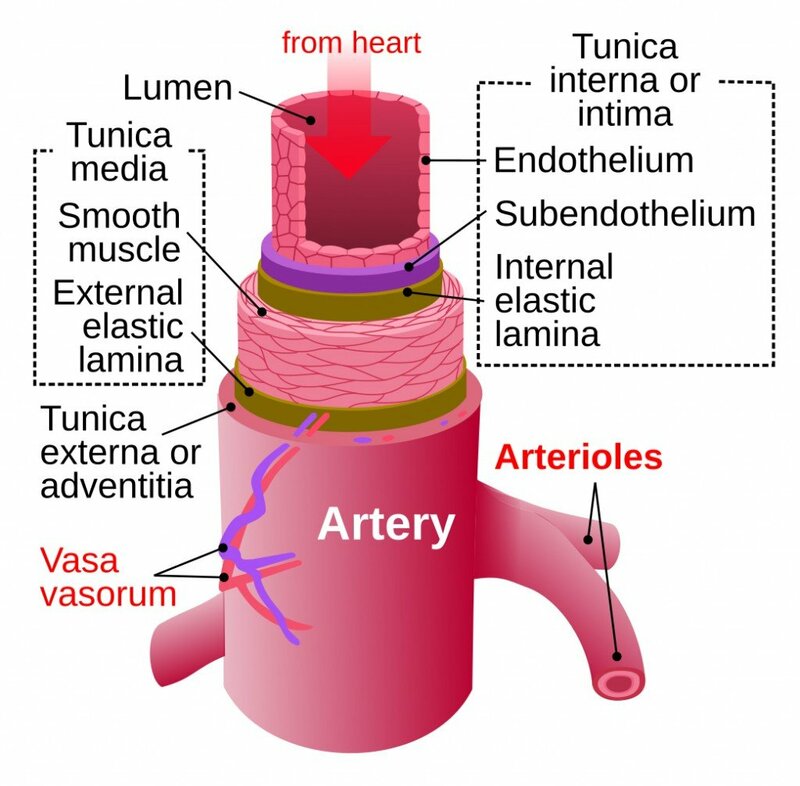 When you look at a blood vessel, moving from the inside to the outside (i.e., from the lumen outwards), the tunics are called the tunica intima (innermost layer), the tunica media (middle layer) and the tunica adventitia (outermost layer). Function & transport: Arteries are blood vessels that carry oxygenated blood from the heart to all the organs. This blood is usually pumped at a high speed from the heart into the arteries. Elastic and muscular arteries are the two distinct types of arteries. Elastic or conducting arteries are composed of many layers of elastic membrane, a membrane that helps the arteries, such as the aorta, accommodate large volumes of blood being ejected from the left ventricle of the heart. However, the majority of the arteries in our body are the muscular or distributing type. The walls of these arteries are muscular in nature and are responsible for distributing blood to all the organs and tissues. Now, these arteries then divide into smaller vessels called arterioles. Arterioles reduce the flow of blood from the large arteries, which is an important step to prevent damage to the next set of tiny blood vessels, called capillaries, into which the blood from arterioles flows. Just to put this in perspective, the aorta has a maximum diameter of roughly 25mm and this branches into smaller arteries that have a diameter of about 4mm. These smaller arteries then divide even further into arterioles, which measure about 30µ-10µ. Structure: The arteries are composed of a lumen in the center and three layers covering the lumen. 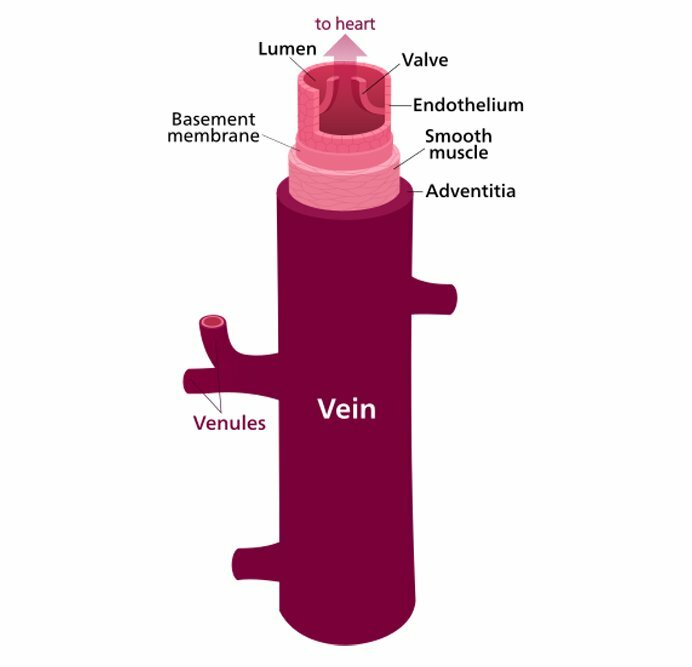 Inner layer or tunica intima – This is the first and thinnest layer covering the lumen of the artery and is made of endothelial cells mounted on a basement membrane. Middle layer or tunica media – This layer is formed predominantly by smooth muscle cells and elastin fibers. Outer layer or tunica adventitia – This layer is mainly composed of fibroelastic connective tissue. Function & transport: Veins are meant to transport deoxygenated or blood devoid of oxygen from the organs to the heart so that it can gain oxygen again. This blood is usually high in carbon dioxide and must reach the heart for oxygenation. The start of this return journey to the heart begins from smaller vessels called venules (about 20µ diameter), which are located near the organs. Venules carry large volumes of blood at any given time and are also known as capacitance vessels. These venules fuse together to form larger veins, which typically have a diameter of 5mm. Veins usually lie between skeletal muscles, which help to squeeze blood during muscular movement. Structure: Veins, much like arteries, have an oval space in the center called the lumen that is covered by the three layers of tissue mentioned above. However, the walls of these three coats have far less muscular and elastic tissue than arteries and contain more fibrous tissue. In general, veins have thinner walls than arteries. Certain medium and large veins (in lower limbs) have valves present in them to prevent the backflow of blood and maintain the unidirectional flow of blood from the organs to the heart, movement that goes against the gravitational force. 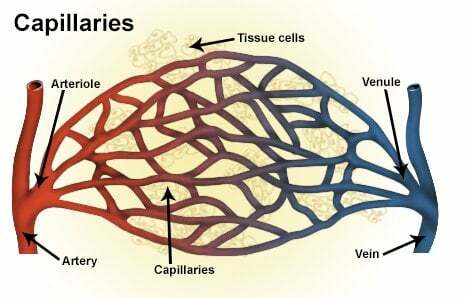 Capillaries are the tiniest blood vessels of the body and serve as the transition link between arteries and veins. Capillaries form a huge network of vessels—almost as big as a tennis court—and it is through this network that a large number of solutes, nutrients, etc. are exchanged between the blood and the surrounding tissues. 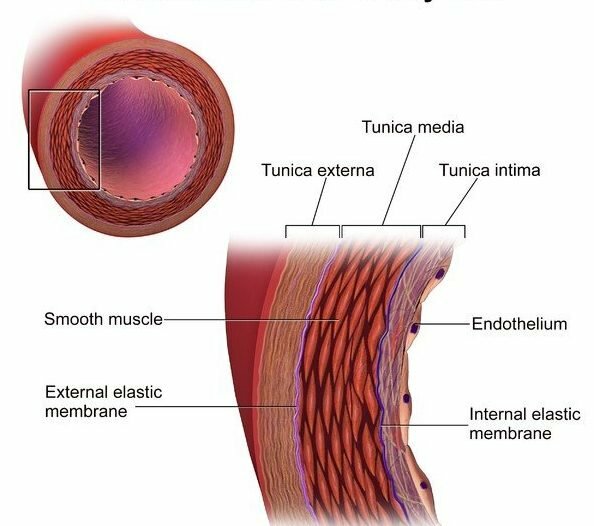 Structurally, a capillary is only one cell thick, so it’s basically only one layer of endothelial tissue on a basement membrane. The thickness of a capillary is as little as 0.25 mm, and there is a total lack of smooth muscle present. There are various types of capillaries, such as the continuous, fenestrated and discontinuous varieties. Continuous capillaries – These are the most commonly found capillaries in the body. Present in organs such as the heart, lung, kidneys, and brain. As the name suggests, they possess an uninterrupted endothelial layer. Fenestrated capillaries – These capillaries are interrupted by pores or fenestrae, which allow only the passage of water and solutes while restricting the passage of proteins. These capillaries, with their selective permeability, are found in endocrine organs and glomeruli of the kidney. Discontinuous capillaries – These vessels contain larger pores in their endothelium, which allow for cellular exchange in specialized organs like the liver, spleen and bone marrow. These blood vessels play an extremely crucial role in transporting blood, nutrients, and waste to their appropriate destination in the body. Think of these as highways, so if there was a traffic jam or an unfortunate accident on the highway, this system of transport would slow down or stop altogether. Problems like this do arise in our circulation system, including the following. Complications in arteries – Conditions like arteriosclerosis or atherosclerosis can affect the arteries. Arteriosclerosis is associated with the thickening and loss of elasticity of the artery, while atherosclerosis is the deposition of cholesterol on the inner walls, thereby narrowing the passage of blood. Complications in veins – Formation of a clot or thrombosis often occurs in veins. When this clot travels through the blood, it causes an embolism, which basically obstructs the flow of blood to the heart, brain, lungs, etc. Complications in capillaries – A significant increase in the passage of substances like fluid or proteins can lead to shock or edema. In the end, it’s good to remember that our network of blood vessels is crucial to our existence, so we must respect our bodies and feed them right so they continue doing precisely what we need to stay alive!